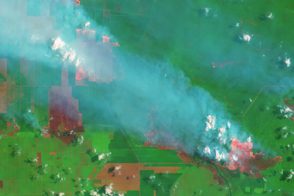 On September 5, 2015, the Operational Land Imager on the Landsat 8 satellite acquired this image of smoke billowing from fires in Jambi Province on the Indonesian island of Sumatra. 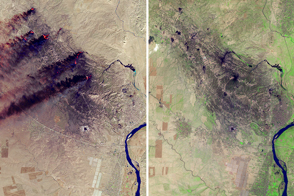 The false-color image was made with a combination of visible (green) and infrared light so that fires and freshly burned land stand out. Fires glow orange, and newly burned land is dark red. 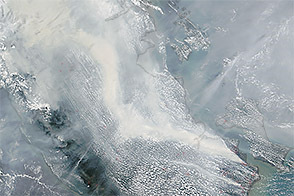 The blue smudges running diagonally across the image are smoke. Bare soil or older burn scars are a lighter shade of red. Clouds are white. The lower image shows a broader view of the area. 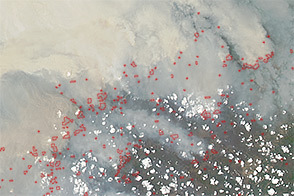 The fact that the fires burned within well-defined rectangular grids suggests that these were agricultural fires intentionally set by growers. 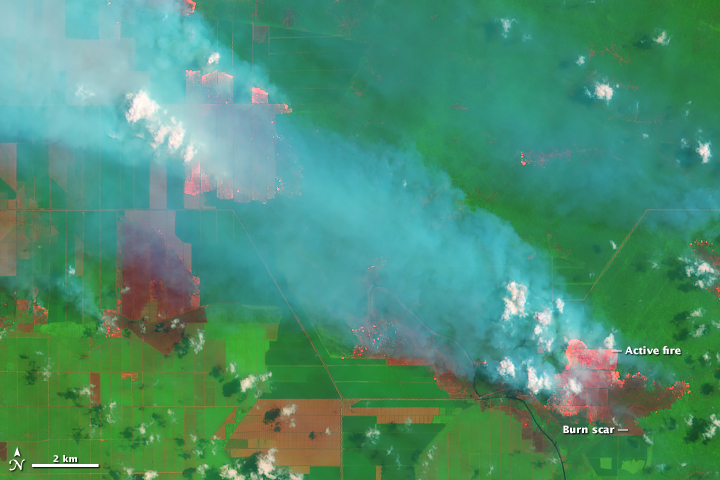 According to land-use maps published by Global Forest Watch, the fires are burning within a palm oil plantation. Palm oil production is highly profitable, and the commodity is an important export for Indonesia, the world’s largest producer. The Jakarta Post reported that heavy smoke from the fires in Sumatra has caused levels of air pollution to spike throughout the island and in parts of Malaysia. Gatto, M. et al, (2015, July) Oil palm boom and land-use dynamics in Indonesia: The role of policies and socioeconomic factors. Land Use Policy, 46, 292-203. Mongabay (2014, April 26) Palm oil, politics, and land use in Sumatra . Accessed September 11, 2015. Taragin, S. et al, (2015) Expansion of Oil Palm Plantations and Forest Cover Changes in Bungo and Merangin Districts, Jambi Province, Indonesia. Procedia Environmental Sciences, 24, 199-205. World Resources Institute (2014, April 18) Indonesia’s Forest Fires Reignite, Threatening Protected Areas and Peatlands. Accessed September 11, 2015. 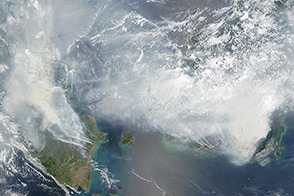 Worldwatch Institute (2014, April 18) The ‘Burning’ Problem of Air Pollution in South East Asia. Accessed September 11, 2015. 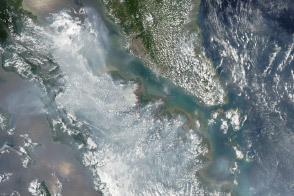 Smoke poured from seasonal fires in Sumatra. 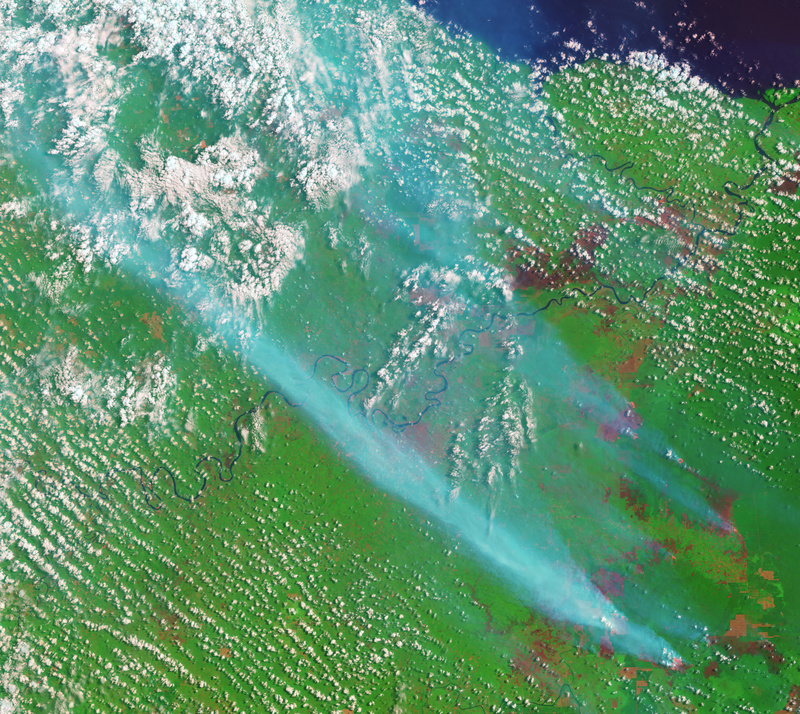 Early September brought seasonal agricultural fires to Sumatra. 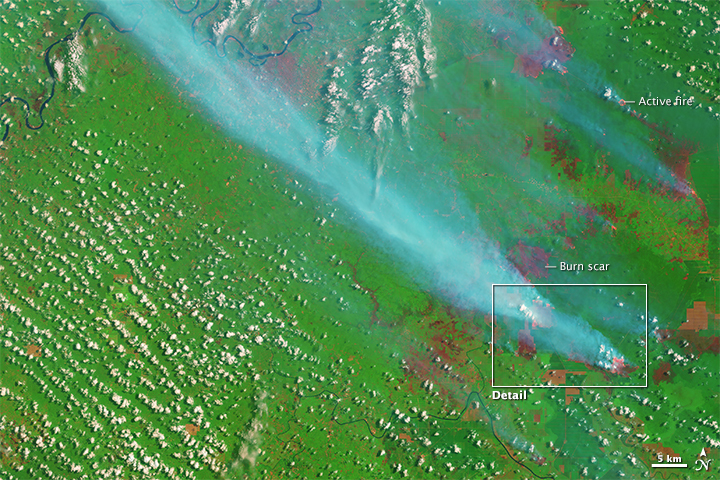 Global Forest Watch (2014, April 18) Fire analyses. From: 2015-9-4 To: 2015-9-11. Accessed September 11, 2015. 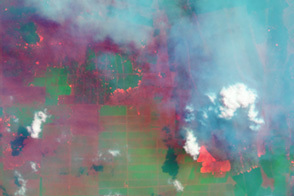 NASA Earth Observatory (2013, July 25) Fires and Farms in Indonesia. Accessed September 11, 2015. The Jakarta Post (2015, September 11) Alarming haze records in Singapore, Malaysia. Accessed September 11, 2015.